eDirectory features deep mapping integration, configurable location hierarchy even down to neighborhoods, and deal reviews just to name a few. Search and filter listings using a map view. The system also has a location detection feature to autofill a visitor's location. With eDirectory you can build your business from a small site with thousands of listings, to a network of sites with millions. Users will find what they want by utilizing our full category system, where you can search by proximity, keywords, etc. Deals and Coupons are some of the most effective ways to bring sales to your sponsors. eDirectory’s integrated Deal and Coupon engine makes creating offers easy. Sophisticated consumers want to read reviews before making their final purchase decisions. The eDirectory review engine also allows sponsors to have a quick managerial responso to a visitor's review/rating with optinal moderation settings. Local Search is a competitive field, and eDirectory has been optimized to drive organic traffic and give you a leg up on the competition. Local Search sites built from eDirectory deliver traffic and drive engagement. The system includes all the key features you need, with content optimized to drive organic traffic. 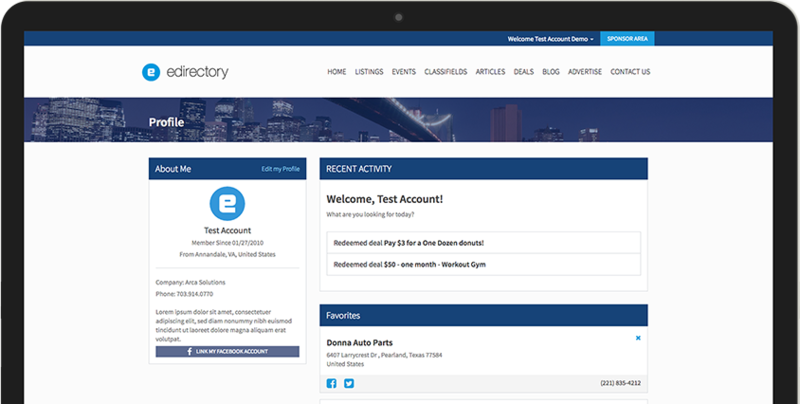 Whether you are creating a deals focused site, or a local guide, eDirectory is the winning platform.